Dina Bseisu is a passionate advocate for the empowerment of Arab Women. She is also a banker with a career in Private Banking that spans over 25 years, having worked with various leading international banks from Geneva. In December 2014, Dina launched “Challenge to Change“; a platform focusing on the empowerment of Arab women. It was officially registered as a non-profit association in May 2016 in Geneva, Switzerland, and is now recognised as the region’s enabling network for women; catalysing positive change with a specific emphasis on those affected by conflict. She earned a BA in Political Science & Economics from Duke University and later on, an MSC in Foreign Services from Georgetown University. In her spare time, Dina writes poetry. She loves alpine skiing, reading, music, and the outdoors. 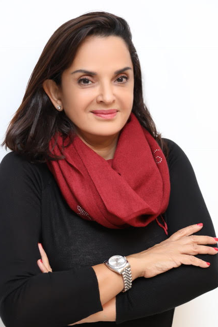 She is the mother of two young adult children, spends her time between Bahrain and Geneva, and travels extensively.